How Was Novaculite Used in the Past? What Other Stones Were Used? Exercises: How was novaculite used? Exercises: What happens when novaculite is heated? Exercises: Where are novaculite sources and distribution areas? Exercises: What can we learn from novaculite quarry sites? Exercises: Can you identify novaculite? 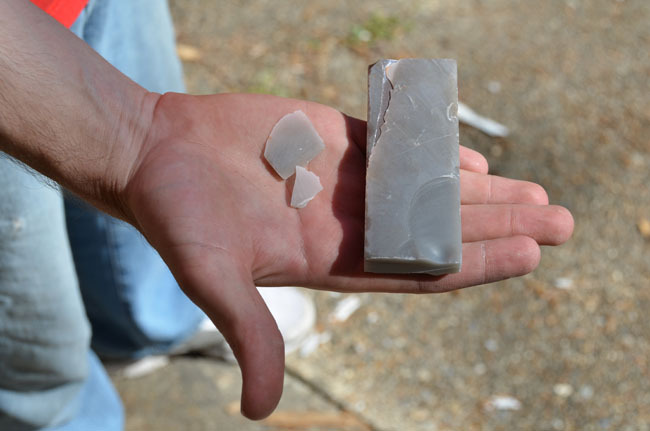 The heat treatment of raw lithic materials, such as chert and novaculite, has been a technique used by Native Americans for thousands of years. Heat treatment, also called thermal alteration involves heating chert or novaculite to improve its flaking properties. The heat treatment procedure involves gradually increasing heat until the desired temperature is achieved, holding the material at the desired temperature for a period of time, and then gradually cooling the material. Heat treatment of novaculite can produce both physical and chemical alterations to the material resulting in changes in color, luster, texture, translucency, and other flaking properties. Steve Kirschman and Tyler Stumpf load the kiln for heat treatment. The Arkansas Archeological Survey, Henderson State University research station (AAS/HSU) researchers set forth a goal of conducting heat treatment experiments on novaculite in order to gain a better understanding of how novaculite changes when heat treated. The collected novaculite samples were heat treated at identical temperatures and the changes each variety of novaculite underwent were documented. Questions about basic physical characteristics were asked. Will the novaculite change in color? Will the novaculite change in luster? Will the translucency of the rock alter? What other physical characteristics change due to heating? Color change is a well-documented result of heat treatment for cherts across the southeastern United States, but does it hold true with novaculite? Luster, or shine, is another characteristic associated with heat treatment in novaculite. Differential luster, or the difference in the luster between flake scars, is a main attribute used to identify heat treatment in novaculite artifacts. Is differential luster a reliable way to identify heat treatment in novaculite artifacts? By asking these various questions researchers hope to gain a better understanding of novaculite and how it responds to thermal alteration. Few modern experiments have been performed involving the heat treatment of novaculite. Don Crabtree and Robert Butler performed heating experiments on a variety of silica resources and their work helped set the standards for future heat treatment experiments. One of the earliest and most thorough experiments was from Jeffrey Flenniken and Ervan Garrison who performed experiments with white novaculite from a Hot Springs, Arkansas quarry. They used a large slab of novaculite from which large, long flakes were removed. These flakes were then formed into bifacial blanks and subjected to thermal alteration. The results observed included a change in luster and improved flaking properties. Later, during an Archeological Assessments, Inc., excavation project, J.B. Sollberger conducted a heat treatment experiment on white novaculite and found a change in color. He also found a change of luster and a change in the flaking characteristics similar to previous experiments. Most recently, in 1997, Patrick McCutcheon included samples of black novaculite in his studies of Southeastern Missouri tool stone heat alteration. Although extremely thorough, McCutcheon’s experiments only included a very specific type of novaculite (black novaculite) narrowing the possibility for large-scale comparisons. Although thermal alteration experiments have been performed on a larger scale using other cherts, the lack of previous novaculite heat treatment research highlights the need for further experimentation and data collection. The researchers consulted with Mr. Steve Kirschman, of Dan’s Whetstone Company in Hot Springs, Arkansas, on the characteristics of novaculite. Mr. Kirschman has worked in the novaculite whetstone business for decades and has a strong understanding of the variations in novaculite, the characteristics of novaculite, and how it responds to tool production and heat treatment. For the experiment researchers collected a large variety of novaculite samples from various Dan’s Whetstone Company quarries. The procedure for the collection of samples was focused on gathering materials large enough to be cut and flaked into testable samples, while allowing enough samples for future testing. Each sample was collected, a GPS point was taken, and photographs of the bedding and quarry area were taken to give a better understanding of where each sample originated. For an explanation of how bedding affects novaculite, watch "Novaculite Bedding Formations with Steve Kirschman." 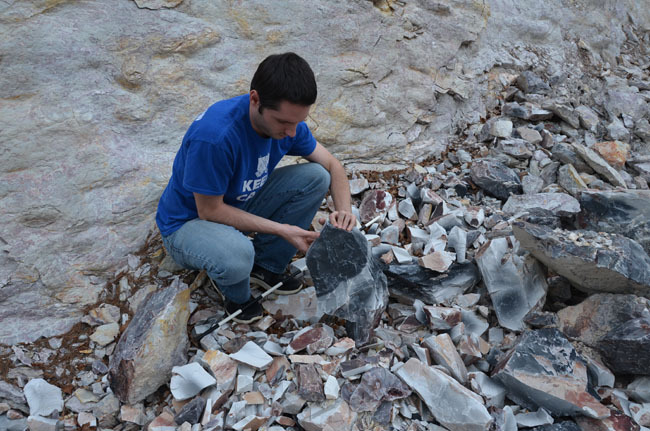 Tyler Stumpf selects novaculite samples at quarry. After the samples were gathered and added to the AAS/HSU collections researchers cleaned and recorded each sample with protocols specified on the “Arkansas Novaculite: A Virtual Comparative Collection” website. The coding sets a control for each sample before heat treatment which allows for comparison before and after the heating occurs. The heat treatment experiments were conducted in electric kilns located at Dan’s Whetstone Company. Both Jeffrey Flenniken and Ervan Garrison and J.B. Sollberger used sand baths in their heat treatment experiments in order to ensure even heat distribution from the kiln’s heating coils. The AAS/HSU researchers also used sand baths for each sample to prevent uneven thermal alteration of samples. Due to the large number and variety of samples collected we decided on six types of novaculite to test at this time. These samples were chosen to ensure the largest variety of novaculite as possible, while remaining manageable. The samples selected are: 2013-576-6) a black novaculite known to accept heat treatment; 2013-575-11) a black novaculite known to not accept heat treatment; 2013-575-8) a gray novaculite; 2013-576-4) a dark gray novaculite; 2013-575-4) a translucent gray novaculite; 2013-576-2) a light gray novaculite. Novaculite samples in sand bath. 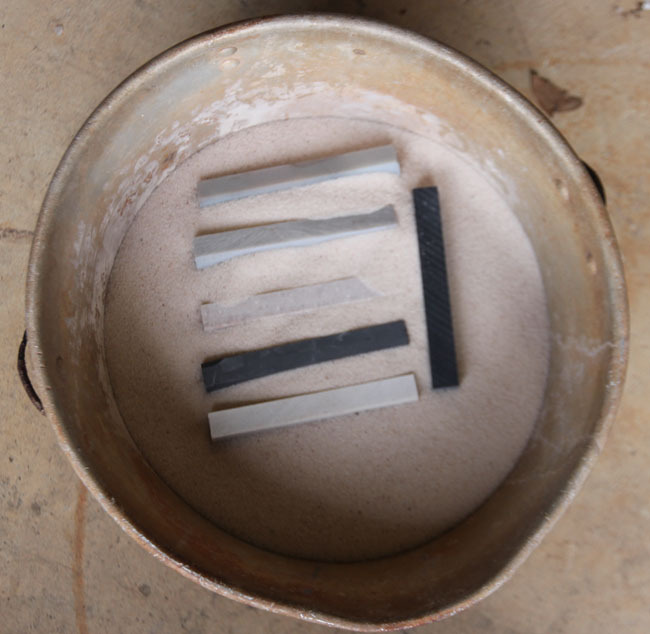 Each sample of novaculite was cut into six identical rectangular slabs (4” x 2” x 1/2”) using a whetstone-cutting saw. 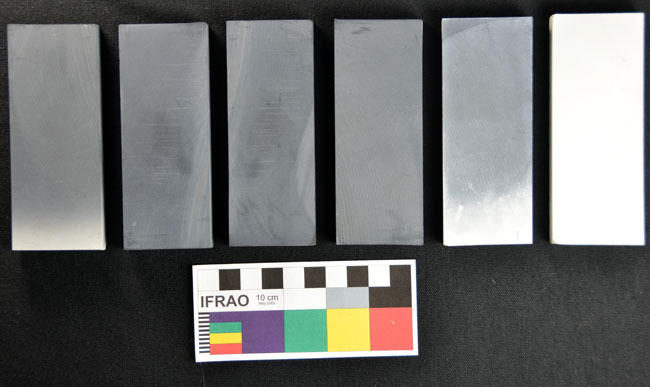 A single slab from each material was unheated and kept as a control, while each of the other five slabs were exposed to one of five maximum temperatures (300° C, 450° C , 600° C, 750° C, 900° C). Each sample’s temperature was increased at a rate of 20° C per hour to 175° C and held for 8 hours as a drying phase. 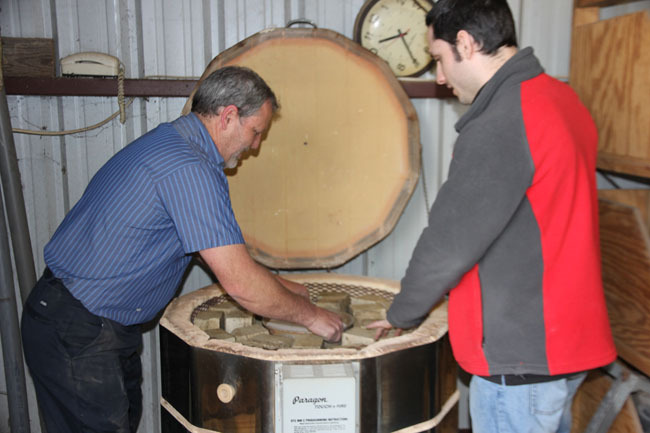 The drying phase ensures that the samples do not explode or crack during the heating process. After the samples finished the drying phase the temperature continued to rise at 20° C per hour until the desired temperature was reached. Once the maximum temperature was reached the samples were kept at this temperature for duration of 12 hours. Once the temperature soak was completed the electronic kilns were turned off and the samples were allowed to cool until they reached room temperature. These temperature ranges were selected to cover the entire spectrum of past experiments and to ensure heat exposure at a variety of temperatures. Novaculite is affected differently depending on the temperature of exposure and by testing a large range of temperatures the researchers can study the thermal alteration of novaculite across temperature ranges. After the samples were heat treated in the electronic kilns they were analyzed again following the protocols outlined above. The color, luster, texture, and other physical properties were put into an Excel Database and compared to the unheated control and other heated samples. After the samples were analyzed they were subjected to a controlled flaking to measure the change in flakability or brittleness. 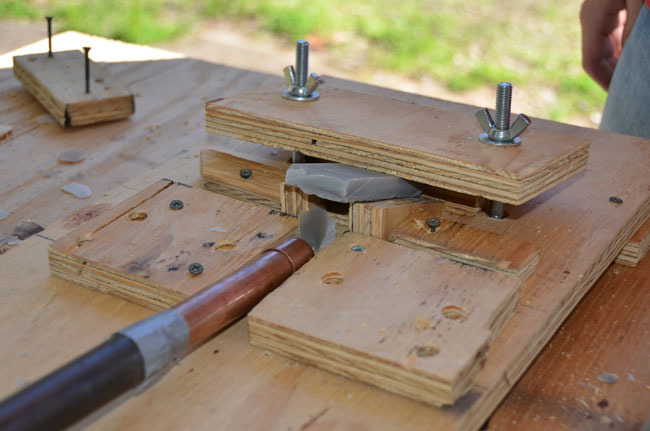 A flaking machine was used and based off of designs from a study done by Craig Picka. We chose to use a flaking machine to flake our samples in order to keep as many variables as possible the same, which allowed for a focus on the change in flake length as a measure of flakability. Slight variations to the blueprints provided were made to suit the size and shape of our samples. 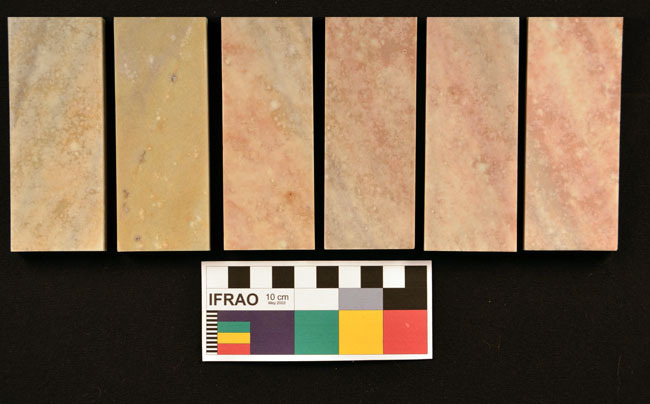 After each sample was flaked using the controlled method the size of the flake scar, the flake itself, and how the sample responded to flaking was measured and compared to discover changes in flaking properties. See the flake machine in action by watching "Flake Machine with Steve Kirschman, Tyler Stumpf, and Mary Beth Trubitt." By comparing the color, luster, translucency, texture, and flaking property changes we can gain a better understanding of how novaculite responds to different heating environments. Noticeable changes were observed throughout the heating process and shed some light on why Native Americans and modern flintknappers go through the effort to heat their novaculite. Flake length comparisons before and after heating. One of the main characteristics the researchers wanted to study was the flaking properties before and after heat treatment. After analyzing the data collected, a distinct change in flaking properties was observed. The mean of heated and non-heated samples was taken and compared. A 17.19 mm average flake scar was observed in non-heated samples, while a 21.56 mm average flake scar was observed in heated samples. This increase of almost 4.5 mm on average per flake scar proves that there is a noticeable improvement in flaking properties after thermal alteration. Flaked novaculite sample from knapping machine. Numerous samples showed a strong change in color from black to white (2013-575-4), a stark change in the shade of gray (2013-575-8), or a change from light pink to darker red (2013-576-6). These color changes do not necessarily correspond to better flaking properties, but could have been appealing for other visual purposes. The color change recorded did not seem to correspond to an improvement in flaking properties or have a correlation to any other characteristic. Comparison of novaculite color change, unheated to heated. Along with color change numerous samples also showed a change in luster. Most samples observed a high sheen after a certain temperature, usually 600 or 750° C. There was not a specific temperature at which all samples observed this change. The variation in temperature at which a change in luster occurs shows how diverse and unique novaculite is. The samples heated during this experiment come from a specific region of the Ouachita Mountains and each sample has a slightly different temperature at which its luster is altered. This variation is astonishing when considering that many of these samples come from within meters of each other. Although almost every sample heated showed some form of luster change, it only occurred after a certain temperature which does not allow for a definitive identification of artifacts based on differential luster alone. Other characteristics need to be considered when identifying heat treatment in artifact assemblages. For a description of how color differences in novaculite can affect color change during heat treatment, watch "Novaculite Color Changes with Steve Kirschman." Translucency was measured both before and after heat treatment but due to the extremely thin flakes removed during the flaking process, a true translucency change could not be realistically observed. Most of the flakes removed during flaking ended up being completely translucent, thus not allowing for a strong comparison of before and after properties. Further flaking and measurements of translucency within these samples could provide better data to analyze and compare. The textures observed before and after heat treatment did not alter drastically. In a few cases a change from a medium-fine to a fine texture was observed, but no changes we could correlate to the heat treatment process. A unique trait observed during the heat treatment was overheating. A few samples became rough, crumbly, and almost impossible to flake after a certain temperature, usually 900° C. This is a definite sign of overheating. This overheating also changed the texture of the samples. Almost all of the overheated samples showed some measure of texture change from either fine or medium to coarse. This change in texture also corresponds to the crumbly or extremely brittle characteristics associated with these samples. After the experiments were completed a few main conclusions surfaced. First, it is abundantly clear that heat treating novaculite produces favorable results for flaking and tool production. It is also clear that the known observed changes in chert also apply to novaculite. Both chert and novaculite see changes in color, texture, luster and other flaking properties when thermally altered. This experiment leaves behind more questions to be answered. The scale and scope of this experiment was focused on creating a foundation for novaculite studies to stand on. Further research into novaculite and novaculite heat treatment is needed to continue our understanding of how this raw material was used in the past. 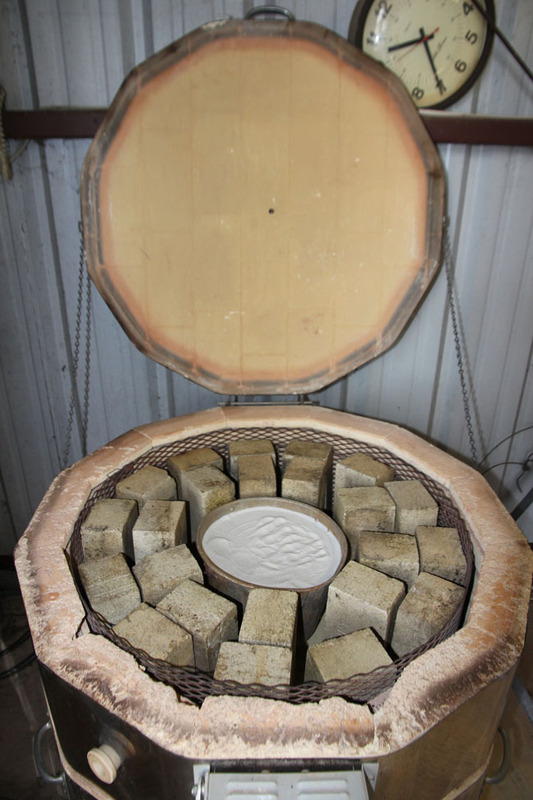 Electronic kiln with samples and sand bath. Ahler, Stanley A. (1983) Heat Treatment of Knife River Flint. Lithic Technology 12(1):1-8. Bennett, W. J., Jr., with contributions from B. Burnett, C. Clark, A. F. Gettys, R. Hollaway, M. Marks, J. Miller, L. Smith, J. B. Sollberger, R. Stewart, and J. Watkins (1986) Investigations at 3HS28, the Jones Mill Site. Report No. 25, Archeological Assessments, Inc., Nashville, Arkansas. Crabtree, Don E. and B. Robert Butler (1964) Notes on Experiment in Flint Knapping: 1, Heat Treatment of Silica Materials. Tebiwa 7:1-6. Flenniken, J. Jeffrey and Ervan G. Garrison (1975) Thermally Altered Novaculite and Stone Tool Manufacturing Techniques. Journal of Field Archaeology 2:125-131. McCutcheon, Patrick. T. (1997) Archaeological Investigations of Stone Tool Heat-Treatment Technology in Southeastern Missouri: An Experimental Approach. Ph.D. dissertation, Department of Anthropology, University of Washington, Seattle. Picka, Craig Matthew (2012) Heat Treatment of Ozark Cherts: An Archaeological Experiment in the Effects of Heat Treatment on Toolstone Flaking Properties. M.S. Thesis in Applied Anthropology, Department of Sociology and Anthropology, Missouri State University, Springfield, Missouri. Purdy, Barbara A. and H. K. Brooks (1971) Thermal Alteration of Silica Minerals: An Archeological Approach. Science 173:322-325. Ray, Jack H. (2007) Ozarks Chipped-Stone Resources: A Guide to the Identification, Distribution, and Prehistoric Use of Cherts and Other Siliceous Raw Materials. Special Publications No. 8, Missouri Archaeological Society, Springfield. Rick, John Winfield (1978) Heat-Altered Cherts of the Lower Illinois Valley. Prehistoric Records No. 2, Northwestern University Archaeological Program, Evanston, Illinois. Schindler, D. L., J. W. Hatch, C. A. Hay, and R. C. Bradt (1982) Aboriginal Thermal Alteration of a Central Pennsylvania Jasper: Analytical and Behavioral Implications. American Antiquity 47:526-544. Arkansas Archeological Survey 2016 "Arkansas Novaculite: A Virtual Comparative Collection." http://archeology.uark.edu/novaculite/index.html (accessed January 15, 2016). We welcome comments and feedback from you! For further information on this website, please contact Mary Beth Trubitt, Arkansas Archeological Survey, mtrubit@uark.edu. This project is supported in part by a grant from the Arkansas Humanities Council and the National Endowment for the Humanities.